Scientists at Trinity College, Dublin say they have made a major breakthrough in treatment for age-related macular degeneration (AMD) – the leading cause of blindness in people over 50. Through their research, they have discovered that interleukin-18 (IL-18), a component of the immune system, can protect patients from vision loss, and it can be administered in a non-invasive way. Since current treatments for AMD involve periodically injecting medication directly into the eyeball, this could have significant implications for AMD therapy. “[IL-18] has already entered into clinical trials [for cancer research], and it has a very good safety profile when administered intravenously. It was never injected into the eye,” study author Matthew Campbell, research assistant professor in genetics at Trinity, told FoxNews.com. AMD has two major forms: “dry,” the more common form, and “wet,” which accounts for 90 percent of the severe vision loss caused by macular degeneration. 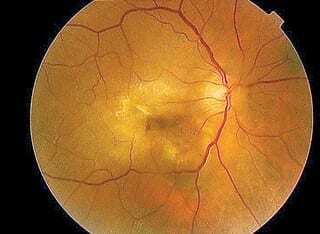 When a patient suffers from wet AMD, the blood vessels grow into the retina, the layer of tissue lining the inner surface of the eye, and begin to leak blood or fluid – causing immediate retinal blindness. Retinal blindness can be especially challenging for patients, as the retina provides sharp, central vision for reading, driving and perceiving small details. In order to combat wet AMD, patients m? patients must receive them on a monthly basis. Campbell and his team say IL-18 can work just as effectively as these anti-VEGF injections, as it produces cells that prevent wet AMD.